Text messages are so important to keep track of something that you really care about. For not losing them due to whatever irresistible reasons, to get SMS backup and restore on Android is a rule of thumb. Read on and find out how to back up and restore them. You will need three things: your Android phone, an app like Gihosoft Mobile Transfer, a USB cable. Gihosoft Mobile Phone Transfer is quite a good app when it comes to accomplishing Android SMS backup and restore. The developer continually updates the app to stay in tune and allow users to backup SMS on Android to PC, which makes things even easier when switching devices or in the event of a factory reset and worrying about losing your backup. Plus, you don’t need to root your Android phone. 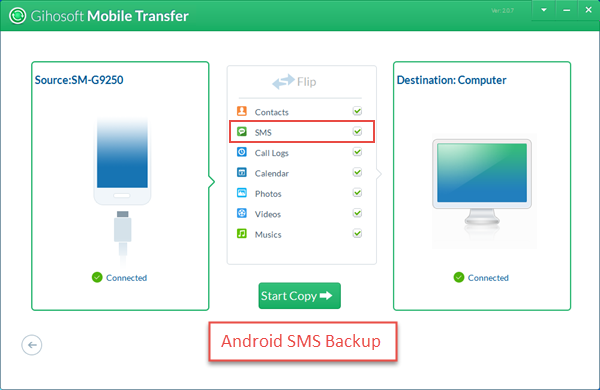 Download the latest version of Gihosoft Android SMS Backup to PC from the official site. After installed, launch the app. When you hit on “Backup Your Phone” on the main screen, you will be given several options to backup, please check “SMS”. And then connect your Android phone to PC via a USB cable. After you Android phone is detected by the program, please click “Start Copy” to start backing up. When the backup is finally completed, a pop-up window will appear to prompt you. Launch the Mobile Phone Transfer on PC and hit on “From Phone Transfer” in the “Restore Data” section, you will see recent SMS backups out there. Choose “SMS” you want to restore and connect your Android to PC. After that, tap “Start Copy”. When the restoration is finished, just like performing a backup, you will get a prompt. Then you can check out your text messages and MMS on the Message app. Note: Please check “Allow” button if a pop-up box appear on you Android phone when connect it to PC. Any questions about connecting, you might refer to How to Connect Android Phone to PC. Meanwhile, please do not disconnect you phone to PC during the process of SMS backup & restore. 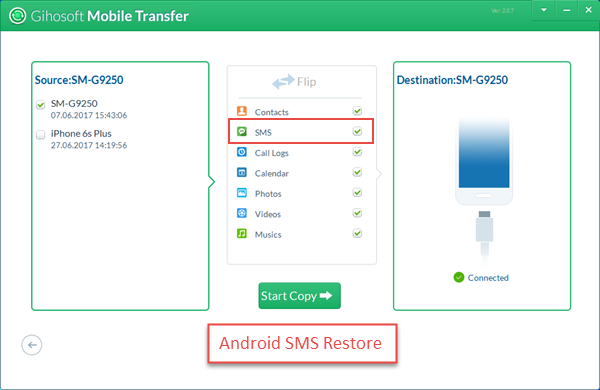 This SMS Backup & Restore app can only restore messages that have been saved. If you don’t have backup, then you need to download Gihosoft Android Data recovery free software. 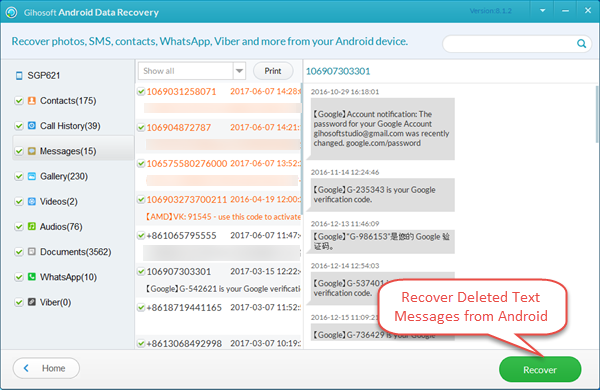 With it, you are not only able to recover deleted text messages from Android phone but also contacts, call logs, music, photos, videos as well as WhatsApp/Viber chat messages and attachments. The supported devices include but not limited to Samsung Galaxy S8/S7/S6, HTC, LG, Sony, Google Nexus, Huawei, ZTE, Xiaomi and One plus. How to Easily Recover Lost Photos from Vault App? How to Screenshot Snapchat and Recover Snapchat Pictures for Android?